MudSling_LC fits best with the standard fitment street biased Metzler Tourance Next, Michelin Anakee, and Bridgestone Battlax Adventure tires. It also fits with 50/50 Mitas, and a limited number of knobby tires, depending on whether mounted to a GS or GSA. This is due to differences in tire cross-section shapes and diameters. There is not much clearance between the rear tire and the Paralever – the GSA has less than the GS – so minor differences in tire shape will determine if the tire will rub the MudSling or not. On the R1200/1250 GS, MudSling fits with Michelin Anakee Wild, and Continental TKC80 knobbies. On the R1200/1250 GSA, Michelin Anakee Wild knobbies DO fit, but TKC70 and TKC80 knobbies DO NOT fit with sufficient clearance. Some customers have reported that Hidenau K60 Scouts are a close fit on the standard GS, while others have reported rubbing the MudSling when the tire is new. Hidenau K60 Scouts DO NOT fit the GSA. Because Hidenau DO NOT fit consistently, we do not recommend using them with MudSling. Pirelli Scorpion Trail II are a close fit. Michelin Anakee Wild knobbies Do Fit on ADV shown below. the swingarm than the standard GS when on the center stand. The MudSling_LC fits fine on the ADV_LC with standard tires, but with TKC80’smounted the tire rubs the MudSling when on the center stand. suspension compresses the more the clearance. 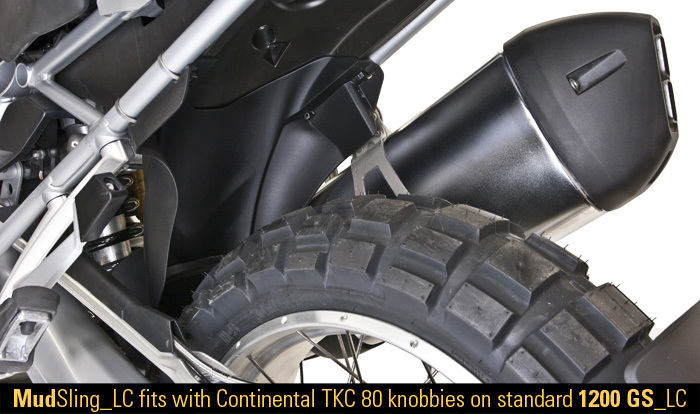 Tires that DO NOT fit GS/A_LC: Continental TKC80, TKC70, Mitas E 07 knobby; Kenda; Shinko 805.
bike to bike which can affect the position of the large underseat plastic moulded liner. That large part is the MudSling’s primary locator. GS #2. Conversly, the MudSling that did not fit on GS #2, DID fit properly on GS #1. 2. Remove the two screws securing the tabs with a T25 Torx driver. 3. Find a 3~4 mm thick rubber washer 20mm in diameter, or cut it out of flat rubber stock. Nylon washers may also be used. Insert the rubber shims under the plastic tabs and re-tighten the screws. This work-around usually works, but is not guaranteed depending on your bike’s assembly tolerances. 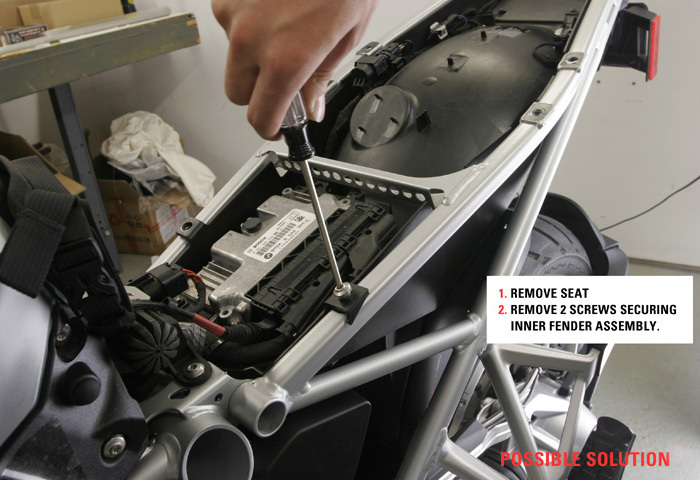 Fitment of the ADVance Guard to the F800, 700, and 650 GS is straightforward using the contents of Kit ADV-GD-K1-GS. 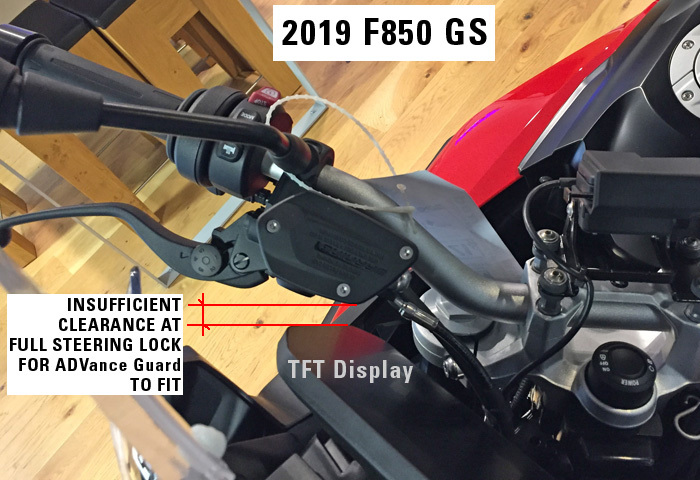 Fitment to the new 2019F850/750GS is more involved in that it first requires installation of handlebar setback mounts (such as those made by ROX – not included) in order to create sufficient clearance between the Guards and these new models’ very large TFT displays. A setback mount is essential to prevent damage to the display at full left/right steering lock. 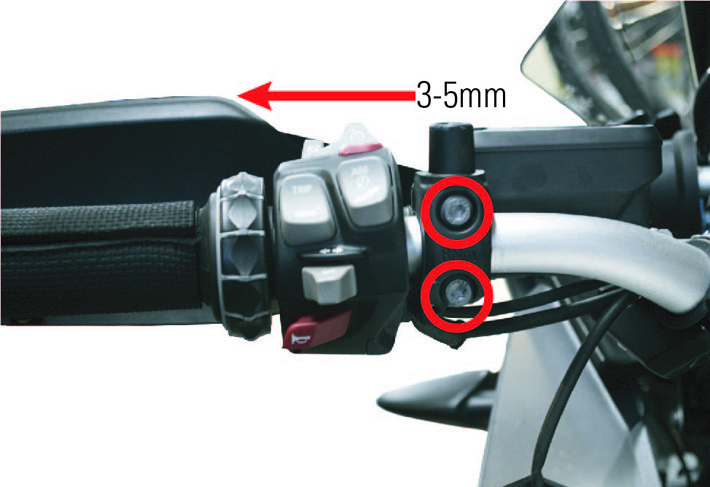 See the photo to understand the tight relationships between the F850GS brake master cylinder and the TFT display. We will update this notice after we’ve mounted a ROX setback mount and taken photos. with long levers and correspondingly long stroke travel. These long levers contact the inside of the ADVance Guard shield preventing proper fit and installation behind the Guards. However, there is a solution in the form of an adjustable length aftermarket lever which you can buy to replace your OEM clutch lever. Since the 2018 Triumph Tiger 800 & BMW S1000XR need adjustable clutch levers, you must purchase one separately from another retailer when ordering the ADVance Guard from us. For the Triumph Tiger 800, order ADV-GD-KIT 1-TIGER. For the BMW S1000XR, order ADV-GD-KIT 1-GS-LC + R-LC. If you have questions, please call us at 908 652 6779. The MudSling R-NineT easily fits the Pure, Scrambler, Urban GS, and Racer models with the OEM shock because these do not have a Preload adjustment feature. However, the standard model R-Nine-T rear shock is preload adjustable and its mechanism is comprised of an adjustment body with knob. This mechanism faces the rear of the bike as delivered by BMW and directly interferes with the coverage area of the MudSling. Naturally, we did not want to exclude the original R-Nine-T from the benefits of MudSling fitment, so an adjustment to the Preload adjustment body position is necessary. First, before starting installation, we recommend that you take a ride and set the pre-load adjustment to your preference. Then, remove the adjustment knob with a T25 driver (To break the grip of Loctite, you may need to use a Ratchet Wrench with a T25 Torx driver). Hold the knob securely to prevent it from turning while the screw is being removed. Please see the downloadable instructions on the product page for details on removal. Next, the Preload Adjustment cylinder must be rotated to the right. It is fixed to the shock via a small set screw (see photo). Loosen the set screw slightly and rotate the adjustment body as shown in the photo below, then re-tighten. This position allows enough clearance to mount the MudSling. Do not re-install the adjustment knob because of insufficient clearance between the shaft and the brake fluid reservoir. Any needed adjustments can be made with an 8mm socket or box end wrench. This was a necessary design compromise to fit a MudSling to the standard R nineT model only. The Pure, Scrambler, Urban GS, and Racer models do not have a preload adjustment feature which simplifies the installation process. Exchanging the OEM shock for a premium aftermarket model like the Ohlins bm440, or bm650 eliminates the clearance issue on the standard R nineT. BMW equips their bikes with an Activated Charcoal Filter Canister that traps and filters unburned fuel. R-nine-T models are all equipped from the factory with one of the canisters shown below. 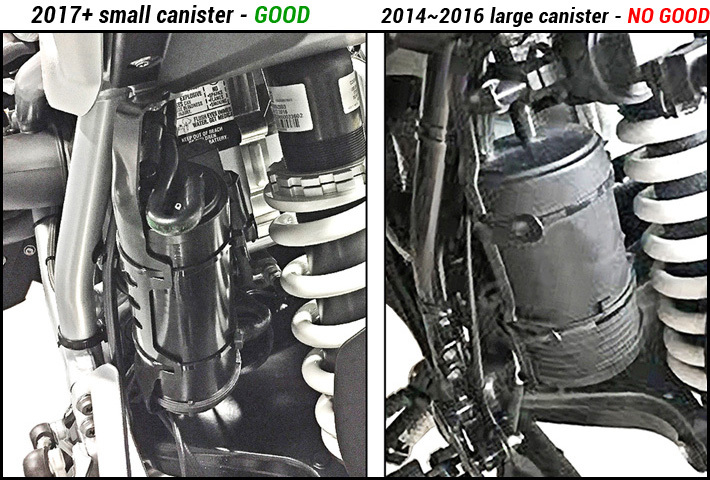 Early model (2014-16) R9T’s have the larger canister (right) mounted, while 2017+ and derivative models (Pure, Scrambler, Racer, Urban GS) use the smaller canister on the left. The larger of the two canisters also has a module mounted to the top of the canister and their very large size inhibits mounting a MudSling to the early models. 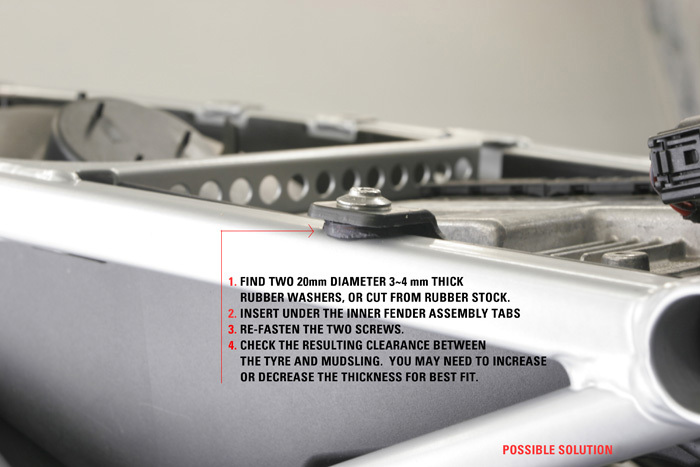 MudSling fits properly to all models equipped with the smaller canisters on model year 2017, 2018, and 2019 bikes without any modification. The T50 bolts that we supply with the X-Head_LC are 3.5mm longer than stock to compensate for the 3.5mm thickness of the X-Head surrounding it. They are made of 12.9 grade steel and the tightening torque is a maximum 10 Newton meters, the same as BMW’s spec. We’ve successfully tested tightening for strength to 24 Nm. – 10 Nm is not much force! Many customers ignore the instructions and do not use a torque wrench, or use an incorrectly set wrench and over tighten. One more “oomph” for good measure can cause a problem – not only risking breaking a bolt, but also damaging the gasket engine cover gasket. Once the T50 bolt is set properly it does not move and is not vulnerable to damage. Below are two images showing X-Head’s protective benefits over a wide contact area after a pavement crash at 40 mph. Its 2 layers of material, a thermoplastic rubber liner and a nylon shell, are designed to flex slightly and wear as speed is scrubbed off. The shell will not break. The T50 bolt is protected within a depression below the contact surface level and you can see that there is no abrasion damage around it. If you have any reservation about installing X-Head_LC properly, take it to a qualified BMW technician to do it properly. You will be very happy with X-Head’s benefits and performance for your R1200_LC model. 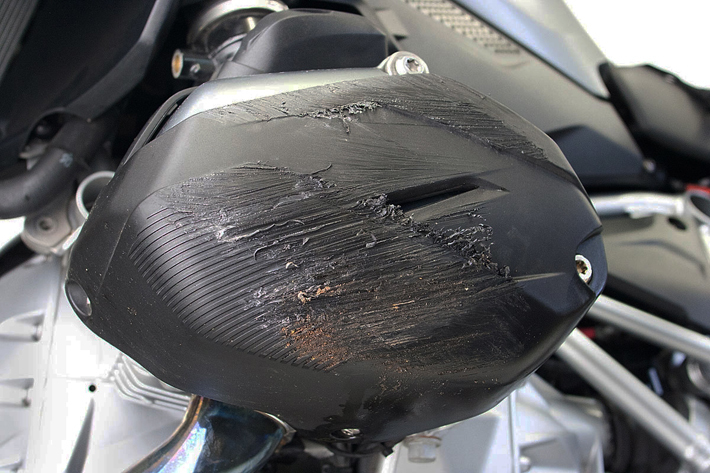 Some customers have encountered difficulty fitting ADVance Guards to their liquid-cooled BMW R1200 GS Adventure (GSA). This model, though very closely related to the standard-issue GS, includes a few features that make installation of the ADVance Guards slightly different. First, the windshield. 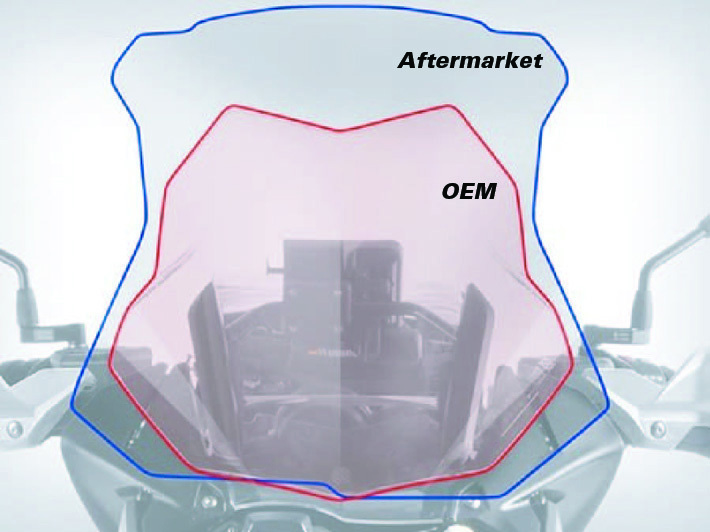 The adjustable windshield found on the GSA is wider than the shield found on the standard GS. 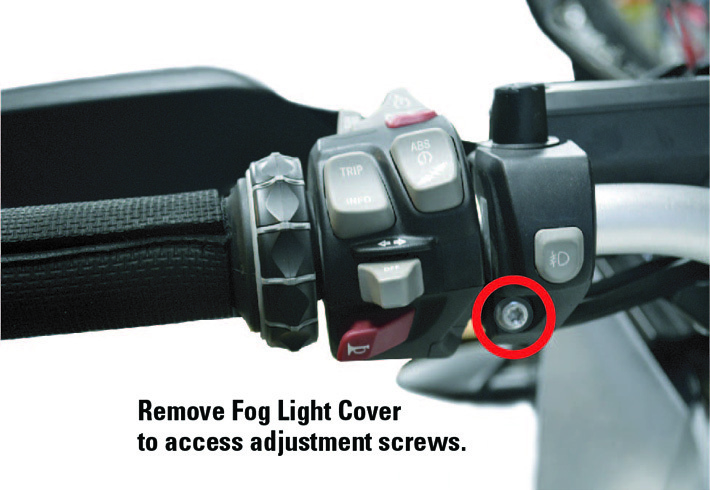 The ADVance Guards can be installed using OEM handlebar end weights, however, the Guards will contact the windshield when the windshield is in its upper-most position and the forks are turned full left or right. If the windshield is generally kept in a slightly lower position, following the included directions will result in a problem-free installation without any modifications to OEM equipment. If full range-of-motion is desired, some adjustments are required in addition to adding the parts in our GSA_LC FIT KIT. Our GSA_LC­­ FIT KIT includes a longer end weight to offset the Guard further from the centerline of the bike. This increases the clearance between the windshield and the Guard. NOTE: The included end weights have been sized to allow clearing the OEM GSA windshield, but they WILL NOT PREVENT CONTACT WITH WIDER AFTERMARKET WINDSHIELDS. Additionally, the updated handlebar mount in the GSA FIT KIT has a 3rd adjustment position added to improve the fit and reduce tension on the aluminum Guard. Offsetting the Guard may require adjustment of the lever perches and, potentially, the clutch/brake reservoirs to gain adequate clearance between the handlebar mount and clutch/brake components. In most cases, fasteners only have to be loosened slightly to enable repositioning these parts. Once all components are positioned properly, carefully tighten all fasteners to fix the Guard’s position. NOTE: Do not over-tighten screws. The threads in aluminum components can strip easily if over-tightened, so for added security, apply Loctite to threads. 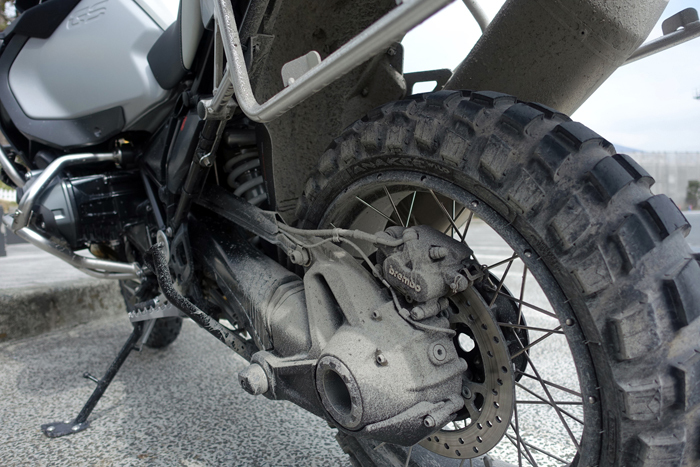 Be sure to check all clearances before riding and never attempt adjustment while moving. 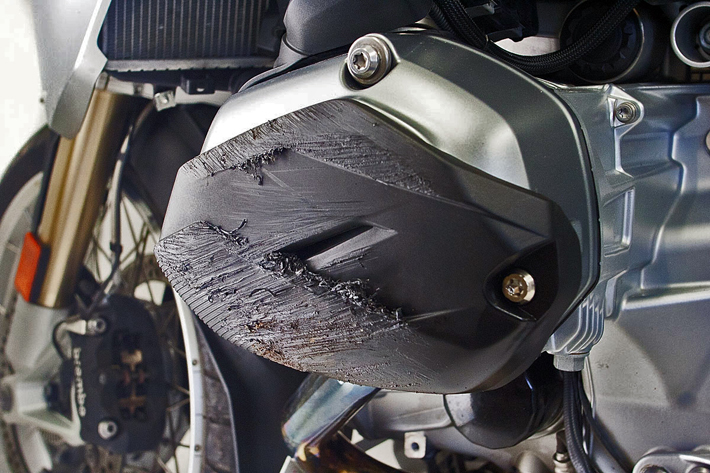 X-Head_LC cylinder guards are designed to fit with BMW’s crash bars on both the GS and ADV liquid-cooled models. This knowledge base relates fitment experience with both 2014~2016 GSA models, and recent information regarding the 2017~2018 GSA. The crash bars on the 2017~2018 GS Adventure have been revised with the addition of thicker rubber pads shown above mounted to the inside of the bars as compared to previous model years. As a result there is less clearance between the pad and the surface of the cylinder head. However, X-Heads will fit on the 2017-18 if the rubber pad is trimmed back 8mm or removed by drilling out the rivets that hold it to the bar. If after installation the pads touch the X-Heads, it will not be detrimental to the X-Heads as the nylon material is resilient. To install the X-Heads you must either loosen the lower crash bars or remove them to give you enough working room (the upper sections are left in place). Then, re-install the crash bars. One customer, who shall remain nameless, tried to force the X-Head in between the crash bar and cylinder without loosening a bolt, unsuccessfully, and gave up. If you have any concern about the process, have the work done by an experienced BMW technician. Posted – March 22, 2015 – The photo below shows both the X-Head and crash bars mounted to a standard GS. On GSA’s there can be Crash Bar to Cylinder Clearance Variation. 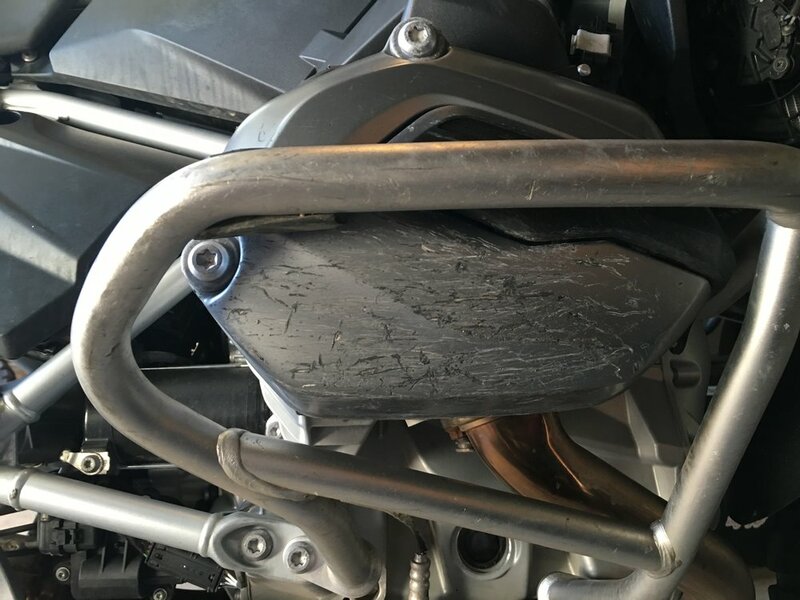 We’ve received feedback from a couple of customers about variations in mounting clearance between the X-Head and their 2015 GS and ADV crash bars. In one case there was sufficient clearance with the bar on the right side, but the rubber pad on the left side touched the X-Head. In a second case the customer reported that the crash bars on both sides of his GS could not be re-installed after X-Heads were mounted. I discovered the reason why after measuring several new GS/A’s at the local dealership. On these new bikes clearances between the bare cylinder head surface and the rubber pad on the bars were as close as 4mm, and as wide as 12mm. Left and right sides were invariably different. Less than 6mm is not enough space to fit X-Heads because of their two layer rubber liner and nylon shell design. Anything more than that is good. X-Head molded parts are identical left to right and their relationship to the cylinder head is the same on both sides. The fact that there were wide dimensional variations between the bars and bare cylinders among new bikes points to crash bar assembly tolerance differences, and possibly production tolerance differences in the bending and welding of the bars. There is a solution for fitting X-Heads to GSA’s with insufficient clearance. – Shims in the form of tubular spacers or thick washers placed behind each of the crash bar mounting flanges that bolt to the engine on bikes needing them will offset the bars slightly to the outside to restore adequate clearance. Adding them will not affect the bars’ function in any way. Even if the rubber pads on the bars end up touching the X-Head slightly after remounting the bars, it will not affect X- Head integrity as they are designed to withstand compressive force in case of a drop. In conclusion, if you do off road riding or want to assure that your heads are fully protected under any circumstances, mounting X-Heads along with bars will fill the voids between the legs of the crash bars and provide the best cylinder head protection. Because OEM crash bars fit with inconsistent clearance, you may need to compensate for tight fits with a bit of trial and error shimming using spacers at all mounting points to make enough clearance for X-Heads.